Wakefield Trinity Wildcats have signed Joe Arundel from Super League rivals Hull FC for the rest of the season. Arundel, 23, joined Hull FC ahead of the 2013 campaign, having previously made over 40 appearances for his hometown club Castleford Tigers, before the age of 20. 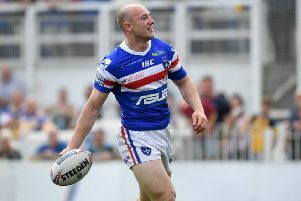 The England Knights representative, was given the number 3 shirt by Hull in his first season with the Black and Whites, however midway through last season, he joined Bradford Bulls on loan and impressed in his spell at The Provident Stadium, making 12 appearances. “We have been patient in that we needed to find a player that could really push for selection that was within what very small amount of budget we had left and with him coming to a financial agreement with Hull allows us to do so. Read Friday’s Wakefield Express for more news from Wakefield Wildcats.